Welcome to Bromley Curtains and Blinds – The blog – our window designated to – window dressing. Clients choosing Bromley Curtains and Blinds to dress their windows, both in their homes and workplaces have the luxury of sitting back and letting us do all the work for them. We will visit you in your home for an initial, free consultation to ascertain what it is you’re looking for, whether it’s beautiful drapes to enhance your home, blackout blinds to help little ones (and you) sleep better or maybe blinds to provide privacy or light filtering in your workplace. Whatever it is you’re looking for we are here to give expert advice. Everything you need to help you make the right decision will be brought to your home. 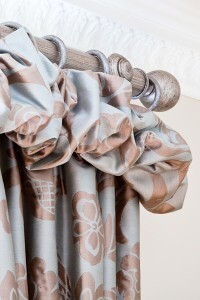 We are suppliers of all leading fabrics, blinds, curtain tracks and poles. Our workshop and fitter have been working together for over 30 years offering a high standard of workmanship, attention to detail and excellent customer service. We plan to post pictures of our work since the launch of the site, together with new fabrics, trimmings and tracks to inspired you, so keep on visiting. Trimmings and tie backs – add colour and interest to your window dressings. Roman Blinds and bespoke sofas and chairs, Chelsfield village. The latest curtain fit – Vintage Sanderson and lampshades – Shortlands, Bromley. Woodbury Interiors trading as Bromley Curtains and Blinds.